Some auction chairs hate themes. I can appreciate their opinion. They don’t want to worry about finding the “right” outfit. They want to feel comfortable. They don’t want to look silly. But today I want to share a story I heard from an Auction Chair that gave me a new appreciation for auction themes. This year, the Auction Chair gave me a surprising new insight into how the auction theme helped her. First, keep in mind that when a group adopts a theme, it usually has to do with the existing committee. Volunteers get bored. Working on the auction year after year is tiring, and a theme can make an event feel “new.” Themes also help a Decor Chair focus her budget. Even returning guests can appreciate walking into the same ballroom, but being treated to a visual change offered through a theme. You don’t need a theme to have a successful auction, but it has those perks. For my client, her chosen theme actually attracted new donors. Like a number of Washington, D.C. educational institutions, this school has an international mix of students. Cultural differences aside, there are also differences in how people understand what a fundraiser is. For Americans, benefit auctions aren’t that foreign of a concept. But if you’re a first-generation American, and your parents affiliate more with the culture of, say, Kenya, or Indonesia, or Norway, they might not be as in tune with what a fundraising auction is or why a school would host such an event. At this school, one Mom is a clothing designer. She might not be a household name (yet), or have a boutique in New York, but she’s got a vibrant business. She sells her Asian-inspired fashion forward clothing out of her atelier in a D.C. suburb. In fact, for the last several years, she’s been asked to participate in Washington, D.C.’s Fashion Week. Every year the school auction committee would send out a letter requesting donations of the parents. Every year this Mom had no idea what to donate. This year, the Auction Chair chose the theme, Mumbai. She contacted the Auction Chair and donated a custom couture outfit and 2 tickets to DC Fashion Week. It sold for over value at $750 in the live auction. Plus, two or three women at the auction wore her clothing. Some planners avoid themes thinking they might exclude people. After hearing this story, I’m now wondering if a well-chosen theme actually does the opposite … including those who previously felt disenfranchised. After hearing that story, you might want to explore more about themes. 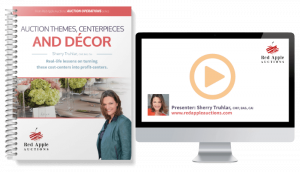 If so, check out my terrific training DVD, Creative School Auction Themes, Centerpieces, and Décor. It will not only inspire you with photos from events, but you’ll learn how to make money from your decor, should that be a desire for you.